Rachel Tompkins is president of the Rural School and Community Trust, a nonprofit educational organization "dedicated to improving student learning and community life by strengthening relationships between rural schools and communities and engaging students in community-based public work." Through advocacy, research and outreach, the Rural Trust strives for policies that enhance the climate for rural communities. Included: Tompkins talks about the challenges facing rural school systems. Education World: What are the greatest challenges facing rural school administrators? Rachel Tompkins: I think administrators would say that their greatest challenge is acquiring the financial and human resources necessary to offer the quality of education students need. I think this is because rural people are a political minority in all but five states and are not well organized enough to articulate their perspectives in state policy-making arenas. EW: What misconceptions do educators and the general public have about rural school systems? Tompkins: The most common perception is that rural places no longer exist. People are always surprised to learn that 25 percent of schools (14 percent of students) are located in areas with populations of 2,500 people or fewer and that 25 percent of students live in areas of 25,000 people or fewer. The second misconception is that there are no problems in rural places. Actually, 244 of the 250 counties in the nation with the lowest per capita income are non-metropolitan. The third misconception is that even if there are problems in rural places, they will all be solved when everyone finally moves away. 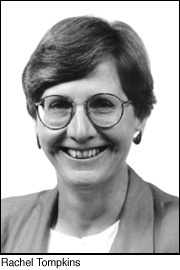 Rachel B. Tompkins has been with the Rural School and Community Trust since its founding (as the Annenberg Rural Challenge) in 1995. She has been a board member since 1995 and has served as the organization's president since October 1, 1999, when it became the Rural Trust. Tompkins has also served as a 4-H Youth Development Extension Agent and leader of the West Virginia University Extension Service. EW: Some national reports indicate that the population in rural areas is declining and aging. How are school systems adjusting to those changes? Tompkins: In schools that are part of the Rural Trust network, elders are a resource. Schools are engaging elders in the community in many ways. In Alaska, elders are working beside science teachers, teaching native ways of understanding science. In Virginia and Mississippi, elder interviews are being conducted to establish a rich oral history collection. In South Dakota, students and adults are engaged in redeveloping the local economy. In many places, elders are mentors and partners with teachers in learning. EW: How are rural school systems recruiting teachers? Tompkins: The flip answer is, "any way they can think of." In many states, the gap between salaries in rural places and salaries in urban and suburban places is very wide. If the gap is $1,000, it may be OK, but if it is $10,000, the recruitment hill is very steep. There are quality-of-work and life issues that many rural places can and do promote. The fact is that rural schools tend to be small, personalized institutions in which children do not get lost. I come from a family of teachers, and I know many teachers are longing for places like that. Some schools are reinstituting some old ideas, like Future Teacher organizations, to encourage their own middle and high school students to consider teaching as a good calling. EW: How is technology changing education in rural areas? Tompkins: Technology allows a rich and diverse curriculum to be offered without transporting everyone to a central site. Telecommunications blunts arguments for consolidation that have robbed so many communities of their most important public institution, the public school. In communities in the Rural Trust network, schools and young people are actively involved in economic development and planning. The technology skills of young people are used to operate the local Internet service provider; students develop Web pages for entrepreneurs to take advantage of e-commerce; and students work side by side with community planning agencies using GIS mapping. In classrooms, teachers are using interactive systems to connect groups of students. A Rural Trust network community in Colorado has been working with a school in Alaska on writing, sharing stories and poetry from very different cultures. Although a digital divide remains, the e-rate has been an extraordinary help and is essential for future incorporation of technology into the curriculum. This e-interview with Rachel Tompkins is part of Education World's weekly Wire Side Chat series. Click here to see our Wire Side Chat archives.